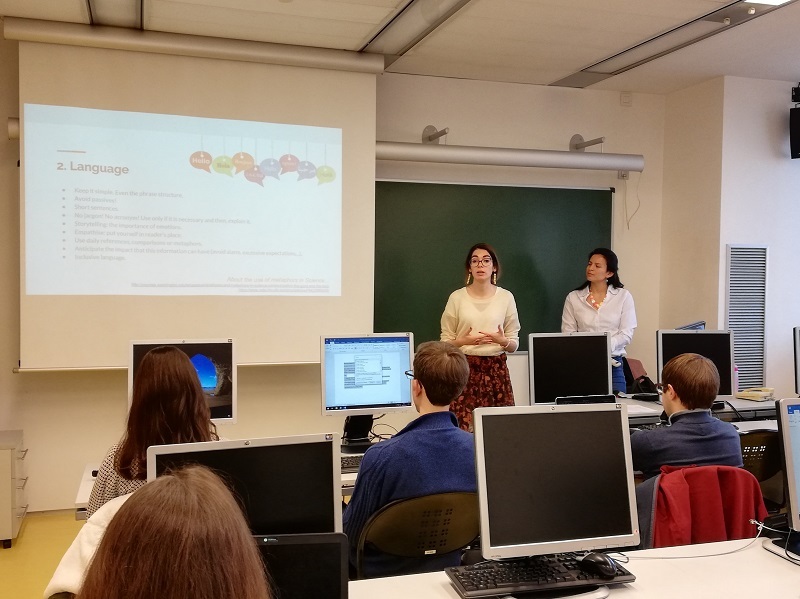 On Wednesday, March 20th, it was held the workshop “Blog your research“, aimed at PhD students of the UPF Biomedicine Program who carry out their research in the centers of the PRBB. 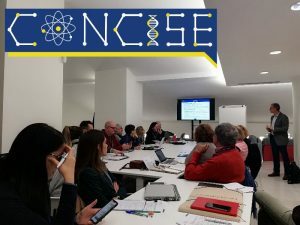 The workshop, organized jointly by the DCEXS, the Science, Communication and Society Studies Center (SCS-UPF) and the PRBB, had as its main objective to provide the doctoral students with tools to explain their research to a non-expert audience. In the first place Carolina Llorente and Luisa Barbosa, researchers at the SCS, offered a theoretical presentation in which they gave some advice to write posts on scientific topics in an informative format. They highlighted the importance of sharing their research with the general public and adapting the language to the readers. Some of the advice they gave focused on avoiding technical terms, using elements such as metaphors and choosing the right images. They also reviewed the organization of the text through the inverted pyramid structure. After that, in the practical part, the participants began to write dissemination articles about their research. They addressed issues such as public health, neurobiology, bioinformatics or nanomedicine. In this part, they also had the support of Maruxa Martínez, from the communication department of the PRBB. In the coming days, attendees will finish completing their articles. You will be able to see the resulting articles published soon in El·lipse and the blog Biomedia Channel! 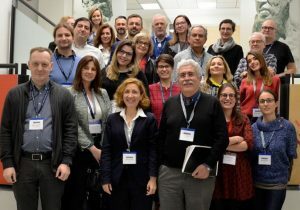 Gema Revuelta and Carolina Llorente participated in the kick-off of the CONCISE project in Valencia on December 13 and 14. The Science, Communication and Society Studies Center (SCS-UPF) leads one of the main tasks of the project. 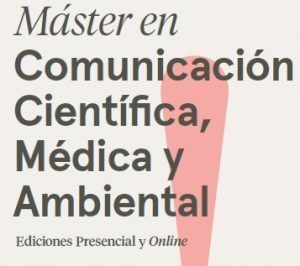 In particular, it will be responsible for developing the theoretical framework, an evaluation of teaching in scientific communication in Europe, the guidelines for developing a public consultation for research purposes. On March 22, the pilot of the first public consultation will take place in Barcelona. Gema Revuelta participated in a session of scientific debates of the Public Health Agency of Barcelona (ASPB), called Vaccine Reticence: the role of pediatric teams. The session took place December 11, 2018, from 1 to 3 p.m., in the Auditorium of the ASPB (Pl Lesseps 1). The talk Communication on vaccines and social networks: the escalation of the disinforming groups was led by Gema Revuelta, director of the Center of Studies of Science, Communication and Society, Pompeu Fabra University. The other talks of the day were Vaccine reluctance in the pediatric teams of Barcelona, by Mireia Garcia Carrasco, Public Health Agency of Barcelona, and Reticent Families: the experience in the consultation, by Manel Enrubia, Director of the Integral Pediatric Pediatric Center Barcelona Esquerra. These sessions are aimed at sharing innovation and knowledge about public health with other professionals and citizens. The format of the sessions consists of moderation (5 minutes) and three presentations of 20 minutes. The session in which Gema Revuelta participated focused on ‘Vaccine reluctance’, a term that has been consolidated to denote doubts or/and resignation to vaccinate for non-medical reasons. The session was moderated by Elia Díez, from the Public Health Agency of Barcelona. Tomorrow, the conference “Connected Health, assistance in diagnosis” will take place at the Palau Macaya at 6:00 p.m. The session will be moderated by Gema Revuelta. In the debate, it will be addressed how the doctor-patient relationship will change with the introduction of diagnostic tools with artificial intelligence. Who will be the last responsible before the decision making? In addition, the need to store medical data and the use of these in order to protect the privacy of patients must be explored. The theme of inclusiveness and of minority or less developed countries will also be explored: will technology advance in diseases that only take place in countries without so many resources? It will reflect on how personalized medicine, which will lead us to smart medicine, should stop being elitist. Dr. Debora Gil, CVC researcher and professor at the UAB. Dr. Begoña Román, professor of Philosophy at the UB. Mr. Marc de San Pedro, coordinator of the “Càtedra TIC Salut Social”. Dr. Stephen Dunne, product manager at Alpha, Telefónica. Dr. Mara Balestrini, CEO of Ideas for Change. The III RSU-UJI Conference took place on November 29 and 30, 2018, at the Universitat Jaume I (Castellón). Carolina Llorente participated in the roundtable “RRI in practice: challenge and opportunities” and later presented the results of the study “What are the keys to create a good practice for citizen participation?“. Integrity and transparency in the management and use of resources are shaped as growing demands of society and raise the challenge of universities and research centers to publicly respond to their actions in a clear and accessible manner. The III Conference on University Social Responsibility (RSU) and Responsible Research and Innovation (RRI) are consolidated as a forum for meeting, reflection and debate on the management of social responsibility in higher education centers. The first day will be addressed in the discussion of the different institutionalization strategies of the RSU, while the second one will focus on the trends and challenges that are posed with a view to favoring more responsible research and innovation. In this way, following the outline of previous editions, the first session will focus on the state of the RSU question, while the second one will be dedicated to the RRI. The days promoted by the University Jaume I have the collaboration of the Spanish Foundation for Science and Technology (FECYT) of the Ministry of Science, Innovation and Universities.